Washington, DC, TRB, 23 January 2012 – TomTom announces a partnership with the Automobile Association (the AA), which will provide the most accurate real-time traffic information for The AA's Traffic News website. 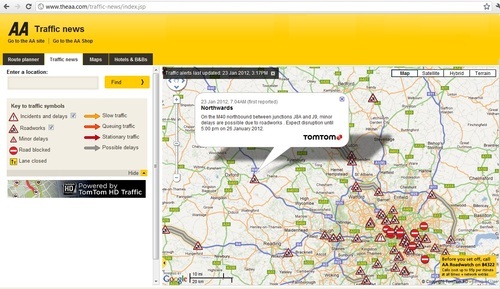 The AA website will now include TomTom HD Traffic data, which provides a live view of road conditions and areas of congestion, enabling consumers to better plan their journeys. Updates are provided every minute ensuring the AA's customers are fully aware of the current road conditions before they start their travel. TomTom HD Traffic provides comprehensive coverage across the UK. "With TomTom HD Traffic, the AA is safe in the knowledge that its users can accurately plan their journeys and be fully aware of the most up-to-date conditions on their routes," said Charles Cautley, Managing Director TomTom Automotive and Licensing. "We believe that by partnering with the AA, TomTom is making it possible to more efficiently use the road network and reduce traffic congestion in the UK." "With winter upon us, we are focused on helping drivers prepare for their journeys by using the most up-to-date traffic information available to ensure they are not caught by surprise with traffic incidents or significant congestion," said Steve Wing of the AA. "We trust that by equipping drivers with TomTom HD Traffic, they will have both a more positive navigation experience and a faster and safer journey." This press release was distributed by ResponseSource Press Release Wire on behalf of Peptalk Communications in the following categories: Business & Finance, Transport & Logistics, for more information visit https://pressreleasewire.responsesource.com/about.